Starting into the rodeo queen world, I was VERY confused about this “Fashion Forward” business. I was confused, as is a lot of other people, about how one could keep the modest and professional pageant expectations of a rodeo queen while making it “upbeat, exciting, and new!” It was through the help of none other than my big sister, Nicole Schrock who was, amongst other titles, the 2013 Miss Rodeo Oregon and Second Runner-Up 2014 Miss Rodeo America, that I began to see the purpose and point of the Fashion Forward push. Fashion….where to even begin on fashion? 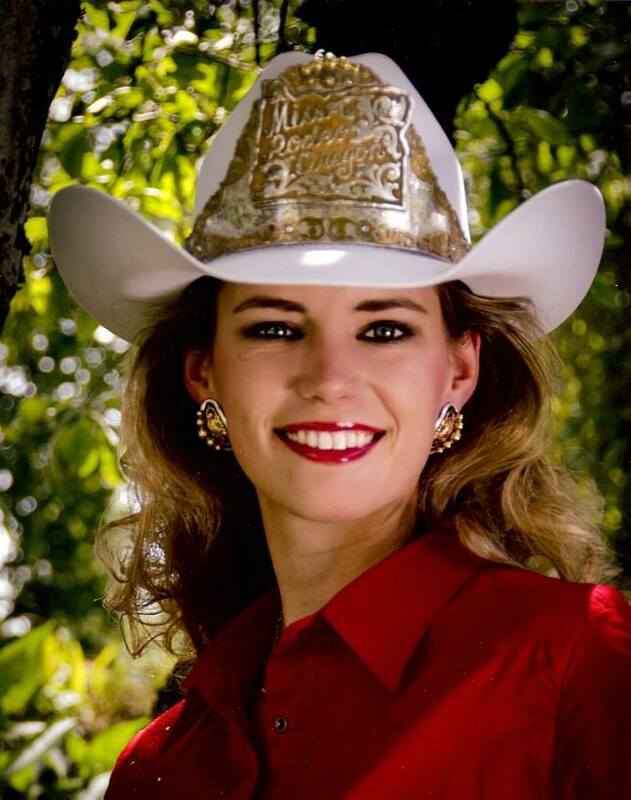 A few years back, I was at a rodeo queen seminar and clinic hosted by Miss Rodeo America. It was the beginning of the fashion forward push from the national level, and the first year state titleholders were expected to wear fashion forward outfits at the competition in Las Vegas in December. For the first time, queen’s were wearing knee length dresses, three-quarter length sleeved shirts, and instead of being condemned as inappropriate, they were being commended for wearing clothes that could be considered marketable to the public. It was a bold new world…one that we were, and in most places are, still given very little guidance by our advisors as to what exactly the phrase “fashion forward” means, and what is an appropriate wardrobe that will encompass being fashionable, and being an ambassador. I live by three rules when it comes to fashion. 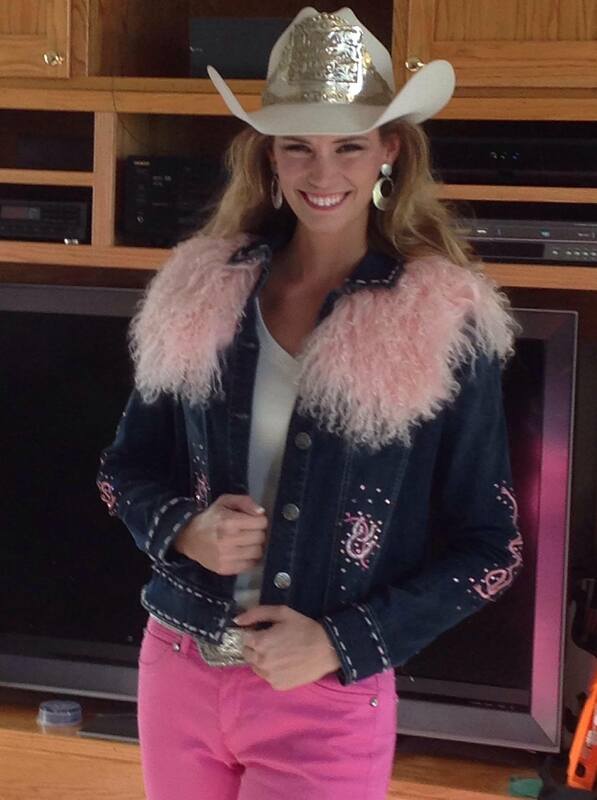 A spiced up Tough Enough to Wear Pink jacket paired with skinny jeans and Buckaroo boots fit Nicole’s Fashion for her jacket makeover at the 2014 Miss Rodeo America Pageant. One of them, is one that stuck with me from the very same Seminar mentioned above. A guest presenter at the clinic was talking about fashion and she said something that has stayed with me to this day. She said, “You either wear fashion, or fashion wears you; make sure it’s the former.” I see so many girls who wanted to wear those big, chunky, western necklaces with their outfits…and while yes, some girls can pull it off, there are many who can’t. They break this rule. Instead of wearing the necklace and having it complement themselves and their wardrobe, the necklace wears them and distracts from their appearance and who they are as a unique individual. Fashion is supposed to help showcase who you are on the inside, and complement your natural beauty; not a shield to hide behind or distract the viewer. While I used an example of jewelry in this case, this rule applies to any piece of wardrobe or fashion accessory. Two; does it fit? While your clothes should fit you physically (not too tight, not too loose), they should also fit with your personality. What does fashion say about you? For example, if you wear a flat brimmed hat, wild rag around your neck, cuffs on your wrist and pack a rope on your saddle, you better be able to back up that fashion statement and be the buckaroo that you are advertising. We all have our own unique personalities, and as such, I believe that everyone should have their own unique style. If you like a little glamour in your life, there is no shame in rhinestones and sequins. It all comes down to staying true to who you are. The public might only get the chance to see you from a distance while you ride in the rodeo, that doesn’t mean you can’t give them a sense of who you are through your personality and your fashion style. If you are a more traditional cowgirl, like the one I portrayed above, the knee length dress with short sleeves, probably isn’t your best take on fashion forward. If what is portrayed as the cookie cutter “fashion forward” outfit does not fit your body style or your personality…then I encourage you to find your own version of fashion forward. For the buckaroo above, that could be skinny jeans shotgunned into a fancy pair of boots, and a modern take on a classic western dress jacket. She can keep her wild rag around her neck and still rock that flat top hat. That is the true beauty of this fashion forward trend…you can make it your own! A simple dress with tulle, and embroidery is another option for Fashion Forward. And last but not least, the most important of all, is it appropriate? This last one is kind of like a quick check in the mirror before you leave for the day. While fashion, and fashion forward, can be exciting, it is important to remember that you are first and foremost an ambassador for the sport of rodeo. While you might not be getting paid, you should still approach this like a job. Ask yourself, is my outfit business professional? If in doubt, find a way to revamp your outfit so that it is. Your dress should not undermine your ability to do your job, impress sponsors and committee members, and showcase the knowledge and public speaking skills that all rodeo queens have. If you are wearing a shorter style dress, it should at least reach your knees. Short sleeves…we definitely don’t want to see arm pits!! A safe bet would be to keep it around elbow length…no tank tops or strapless dresses is highly recommended. Next question to ask yourself, does my outfit go together? This is one of the biggest complaints I have for queens I see today. Fashion forward does not mean combining as many fashionable pieces as possible. Sometimes, less is actually more when it comes to fashion. This ties in everything I’ve spoke of so far. Layered necklaces can be a great accessory, but sometimes a girl can drown herself in too many, distracting from the rest of her outfit (rule number 1). More colors, is not necessarily merrier. If you have a cute pair of boots you want to build an outfit around, that’s great! But don’t just throw a cute pair of boots with an outfit…they both might be cute, but that doesn’t mean they complement each other or tie your outfit together (rule number 3). I see so many outfits out there that are just too busy, mixing colors, fashions, types of leather, fringe, etc. Showcasing one or two fashion forward pieces can help keep the focus on your personal style and give the public a better sense of your personality… otherwise it looks like you are just wearing what you are told to and not what you really want (rule number 2). I hope this article has helped you in your journey to find your own personal style! Fashion is who you are on the inside, just reflected on the outside…so show us who you truly are! With all that being said you also have to understand the rodeo committee that you are representing. You have to understand the image that your rodeo committee is using for their brand recognition, meaning that you don’t want to contradict that image. For example, if you were a member of the Pendleton Round-Up you would find ways of bringing retro fashion back into your fashion forward rather than going with glitter, glam and risky lengths. On the other hand if your rodeo committee is on the cutting edge, reaching a modern public who wants to see more of the modern day fashion than you will probably be encouraged to wear a cutting edge outfit. Some committees prefer a traditional cowgirl look while others want their royalty to sparkle in the arena. In the end, you are their marketing representative and should be prepared to promote your rodeo in the way the committee prefers. At the end of the day we are all learning. I request that you don’t reach out with negativity, threatening comments, and more as I have seen. Fashion Forward is something that queen coordinators, queens, advising committees and more are trying to feel out. We, as a rodeo queen community, are on the same team – we should build each other up, not tear each other down! What are your thoughts on Fashion Forward? Do you have pictures you would like to share with us? Leave them in the comments below, we are excited to hear what you have to say! It’ll Be What It’ll Be! Very good information – I am making a fashion forward out-fit for a Queen and if it was my daughter I would not do it for her. But I am to old fashion they tell me. 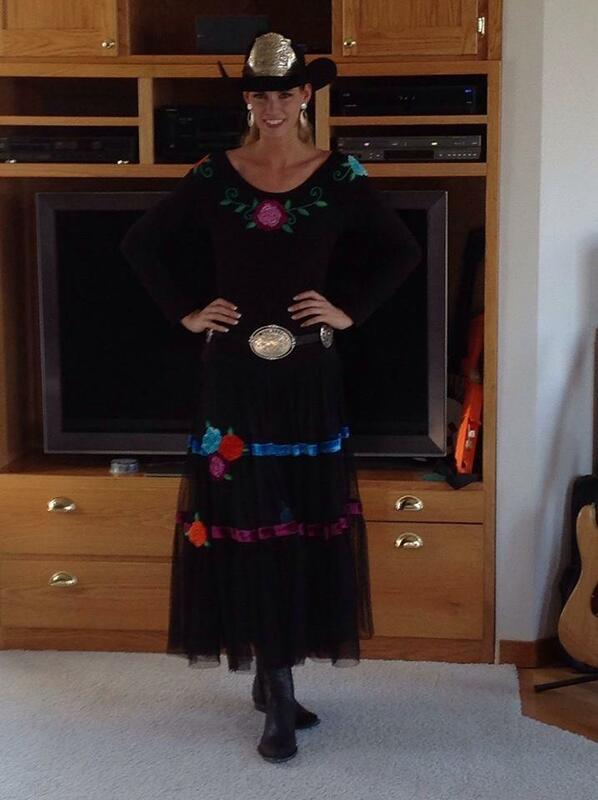 One thing I know for sure- fashion forward has as many definitions in the rodeo queen world as there are styles! In some states, fashion forward holds a more traditional and classic approach while in others it means envelope pushing, trend setting, cross over appeal. Either way, it is awesome to see western wear in all its personalities!